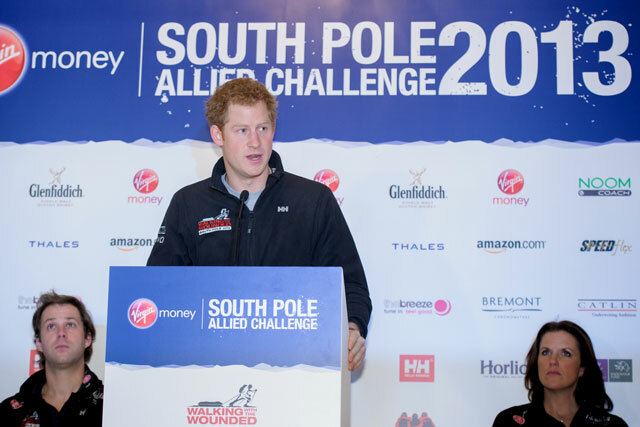 Prince Harry today paid tribute to sponsors such as Virgin Money and Glenfiddich for supporting Walking with the Wounded's recent South Pole fundraising expedition, in which the Prince took part. The charity staged a race across Antarctica in December, with Prince Harry, ‘The Wire’ actor Dominic West and ‘True Blood’ star Alexander Skarsgard joining UK, US and Commonwealth teams to raise money for wounded servicemen and women. Virgin Money sponsored the South Pole trek, which the three teams finished together due to poor conditions, while Glenfiddich backed the UK team, featuring the charity’s royal ambassador. A documentary following the 13-day trek will be broadcast in ITV in March. At a press conference in London today, Prince Harry thanks sponsors – including apparel maker Helly Hansen, telecoms firm Arqiva and Horlicks – "for making this [expedition] possible". Glenfiddich senior brand manager Sarah Harding told Marketing the partnership is "mutually beneficial" for brand and charity: "The reason we get involved is that the stories they tell, the inspirational people and how they have overcome challenges, has a spirit which matches our heritage." The First Drinks-owned whisky brand promoted its sponsorship of the UK team, Team Glenfiddich, through an ad campaign, as well as a limited edition whisky called Spirit of the Nation. Proceeds from sales of the variant went to Walking with the Wounded. Harding added: "We do get lots of coverage from it, which is fantastic, but we do it in a way in which we’re not the stars of the show. It has been great for the brand." Walking with the Wounded's brand strategy has been devised by agency Captive Minds. Come back tomorrow to watch a video report from the event.